The OptiPlex 760 featuring proven technologies for reliable mainstream productivity. OptiPlex delivers for your business so you can focus on moving your business forward. Viruses. Security breaches. Lost data. The OptiPlex 760 mainstream desktop offers a wide array of security offerings to address critical security challenges. Protect critical data with a range of enterprise-class options, including a biometric fingerprint reader, SmartCard keyboard or full disk encryption hard drive. Gain fast and efficient control over your security features with Dell ControlPoint software. The OptiPlex 760 gives you the power to choose your level of security, from hardware to software, local or remote. Simply match the desktop security options with your business priorities and keep your critical information protected. Choose the OptiPlex 760 so you can focus on moving your organization forward. The OptiPlex 760 incorporates green technologies such as Dell’s Energy Smart power settings and energy-efficient power supplies to reduce environmental impact — as well as your organization’s energy bill. 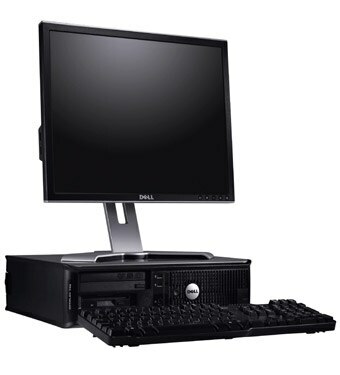 Ranked at the top tier of environmental performance by the Electronic Product Environmental Assessment Tool (EPEAT Gold), the Dell OptiPlex 760 reflects Dell’s understanding of the importance of green technologies to your company and your company’s bottom line.